Simulated and empirical community intermixing under two ecological scenarios, baseline mutual competition and inter-population cooperation (i.e., obligate mutualism). (A) Schematic approach for investigating intermixing in the z- dimension (i.e., through vertical community cross sections). (B) In addition to the two ecological interactions depicted here, Momeni et al. also investigated commensalism, amensalism, mutual antagonism and victim-exploiter interactions. (C) Low (left) vs. high (right) intermixing in the z-dimension according to the authors' fitness model of baseline competition vs. strong inter-population cooperation between green and red simulated populations. (D) Low intermixing in the authors’ diffusion model ('Diff. Mod. ', above) and empirical tests ('Exp. ', below) with yeast strains engaging in equal-fitness baseline competition. (E) High intermixing in the diffusion model (above) and empirical tests (below) with yeast strains engaging in strong cooperation. Yeast strains in the empirical tests (micrographs marked 'Exp') were engineered to express green or red fluorescent protein so that they could be discriminated optically. Scale bars = 100 microns. Figure assembled from the original manuscript, with permission granted under the 'Creative Commons Attribution License'. A cornerstone of ecology is Gause's Law of Competitive Exclusion, which holds that two ecologically similar species competing for the same resources cannot co-exist indefinitely (Gause, 1932). Depending on environmental conditions, one of the species will gain the upper hand and locally drive the other species to extinction. In developing this principle, Georgyi Gause pitted different species of yeast against one another in laboratory competition experiments, arguing that conditions in the natural world are often too complex and variable for basic ecological principles to be uncovered. Following this same rationale, principal investigator Dr. Wenying Shou (Basic Sciences Division), Dr. Babak Momeni (a postdoctoral researcher in the Shou Lab) and two of their collaborators employed cutting-edge techniques in biotechnology and mathematical modeling to investigate a related ecological problem: How do different symbiotic interactions affect the intermixing of microbial community members, thereby shaping the geometry of a biofilm? Momeni et al. published their findings in the exciting new journal eLife, a media-savvy publication that was brainstormed in 2010 at a Janelia Farm workshop and is now co-sponsored by the Howard Hughes Medical Institute, Max Planck Society and Wellcome Trust. Ecological interactions known as 'symbioses' vary from antagonistic interactions, including competition and parasitism, to beneficial interactions in which neither interacting partner is harmed (e.g., commensalism and mutualism). Symbioses play fundamental roles in shaping the microbial communities that have direct effects on human health, including oral biofilms, vaginal microbial communities and the pathogenic biofilms that infect wounds. Often, microbial community geometry has a strong impact on its function. For example, waste treatment granules consist of discrete layers of different microbial species. These layers act as stratified catalysts, facilitating the breakdown of sewage. Despite the importance of microbial symbiosis and biofilm structure on human health and biogeochemical nutrient cycling, the basic ecological 'rules' that shape biofilm structure remain poorly understood. Momeni et al. took a multifaceted approach to investigate how ecological interactions between strains of yeast (Saccharomyces cerevisiae) affect population intermixing during community growth. The authors first simulated ecological interactions using either a Darwinian fitness-based model ('the fitness model') or a model based on nutrient diffusion dynamics ('the diffusion model'). 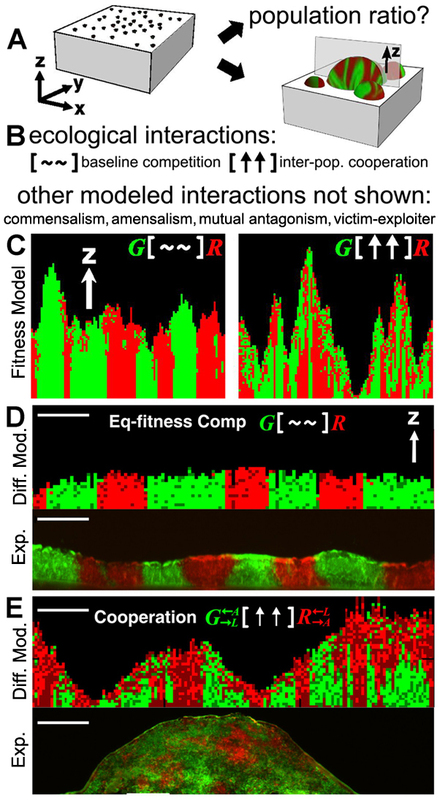 Six different interactions were modeled: the mutual competition typically experienced between similar strains (the baseline condition); commensalism (one strain benefits while the other is unaffected); amensalism (one strain is harmed while the other is unaffected); mutual antagonism (both strains harm each other); the victim-exploiter interaction (one strain benefits at the expense of the other); and inter-population cooperation (e.g., two strains reciprocally rely upon one another for an essential nutrient). The investigators then tested the predictions generated by these mathematical models. Their empirical tests were made possible by the ability to genetically engineer red and green fluorescent yeast strains (i.e., populations) that could engage in any one of the six ecological interactions, for example by forcing one strain to require a nutrient produced by the other strain (Shou et al., 2007). Their tests were further enabled through techniques developed by Momeni and Shou (2012) for freezing the communities at given time points and sectioning them using a 'cryotome'  a tool with a name derived from ancient Greek words meaning 'to cut an icy cold object into very thin sheets'. This allowed the authors to study ratios of population sizes and degrees of strain intermixing in the vertical z-dimension of yeast communities grown up on agarose plates (see figure). Both their simulations and empirical tests pointed to the same general conclusions about how ecology affects microbial community structure. First, the authors found that only ecological interactions involving advantages to at least one of the populations (i.e., commensalism, the victim-exploiter interaction or mutual cooperation) can generate stable population ratios. Mutual cooperation yielded globally stable community composition under the widest range of conditions, whereas the victim-exploiter interaction was, at best, locally stable. A globally stable system returns to the same state after a perturbation of any size, whereas a locally stable system can be moved to new stable equilibrium by a sufficiently large perturbation. Second, Momeni et al. found that competitive interactions led to spatially segregated yeast populations (see figure). In contrast, cooperation led to the spatial intermixing of strains, which successively climbed atop one another as the community grew, as long the spatial sphere of cooperation was sufficiently localized and each partner received a sufficiently large benefit from cooperating. The authors confirmed this result with more complex simulations involving five interacting populations and with an empirical investigation of a methane-producing community of Desulfovibrio vulgaris and Methanococcus maripaluduis, which cooperate through redox coupling. For well over half a century, Gause's Law of Competitive Exclusion has served as a central framework that has helped community ecologists and evolutionary biologists think about how species coexist in nature. The new findings from the Shou Lab are now helping biologists to erect an analogous scaffolding for thinking about the mechanisms by which ecological interactions shape microbial community patterning. Momeni B, Brileya KA, Fields MW, Shou W. 2013. Strong inter-population cooperation leads to partner intermixing in microbial communities. eLife 2:e00230. Also see: Gause GF. 1932. Experimental studies on the struggle for existence. I. Mixed population of two species of yeast. J. Exp. Biol. 9:389-402. Momeni B, Shou W. 2012. Cryosectioning yeast communities for examining fluorescence patterns. J. Vis. Exp. 70:50101. Shou W, Ram S, Vilar JMG. 2007. Synthetic cooperation in engineered yeast populations. Proc. Natl. Acad. Sci. USA. 104: 1877-82.